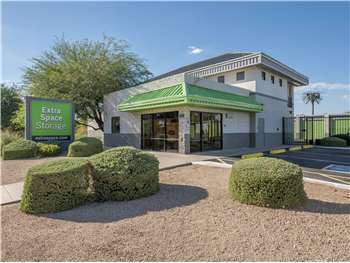 Located on E Madero Ave between E Baseline Rd and E Guadalupe Rd, Extra Space Storage serves Mesa residents near Superstition Springs, Val Vista Lakes, and Gilbert. Locals will recognize our facility across from Wells Fargo Bank a few minutes northwest of Superstition Springs Elementary School and Monterey Park. We're also accessible for residents of nearby apartments, such as Sonoma Landing Luxury Apartments, Lakeview At Superstition Springs Apartments, San Montego Apartments, and more. This facility at 6840 E Madero Ave, Mesa, Arizona, is clean, convenient to Highway 60, and has great hours (6a to 10p). I often see evidence that the exterminator comes monthly or bi-monthly, so that is a perk that we customers don't have to take care of. I love the fact that the lights in and around the facilities are automatic, as I feel safer at night with the lights on. The air conditioned units are actually swamp coolers so it is a humid 'cool' in the indoor facility, but it does pretty well up to about 95 degrees outside temp. It's often over 100 so I wish the facility AC was freon based but I know the cost wold be exhorbitant for this large of a facility. Anyway, the humidity from the swamp coolers tends to make the cardboard boxes in the garage units wilt, but hopefully I won't need to use the unit for more than a year. The office managers are very nice and helpful. Just south of the 60 and across the street from the Well's Fargo Bank. On Power Rd, between Baseline and Guadalupe. Drive south on S Power Rd. Pass Power Square Mall and continue south. Turn left onto E Madero Ave. Our facility will be immediately on your left. Drive north on S Power Rd. Pass Liberty Arts Academy and continue north. Turn right onto E Madero Ave. Our facility will be immediately on your left. Drive west on E Baseline Rd. Pass Desert Sands Golf Course and continue west. Turn left onto S Power Rd. Turn left onto E Madero Ave. Our facility will be immediately on your left. Drive east on E Baseline Rd. Pass Arizona Health & Technology Park and continue east. Turn right onto S Power Rd. Turn left onto E Madero Ave. Our facility will be immediately on your left.